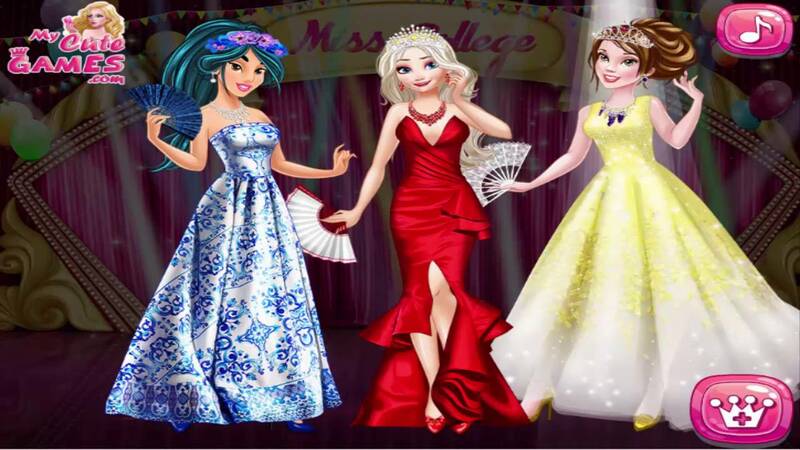 Play new game Princesses At Miss College for free online at our website Elsagames.org. You can play this game in your browser, your mobile and enjoy it for free as well. In this game, you will meet again three Princess Jasmine, Elsa and Belle. As you know, they are going to become rivals for one night, because each of the three dreams of winning the pageant. Now, you must choose the nice outfits for them. Int he first game, you help Princess Jasmine to choose nice long dress, high heels. Then you will pick up some accessories such as earring, necklace and bracelet. When everything for Jasmine is done, you will go to next the page of game and help Elsa and Bell to take the same thing as Jasmine. This is a simple game but it is very funny and interesting. Besides this game, we have many other games such as Elsa And Rapunzel Piano Contest, Elsa Time Travel Japan, Princesses Rooftop Party, Elsa In Vintage Kitchen, BFFs Summer Beach Picnic,...All games are free and we update new game daily. I hope that you will like this game and come back here to play more game. Have fun playing this game called Princesses At Miss College! Play this game with your mouse and help Elsa, Jasmine and Belle to get a perfect look.